Atlantic Yards CDC: updating the board; more apartments in B4 tower; still calling project "Atlantic Yards"
This is the third of five articles regarding the 3/15/19 meeting of the Atlantic Yards Community Development Corporation (AY CDC), set up to advise the parent Empire State Development (ESD). The first article concerned the expected 2022 completion date for the middle school. The second article concerned the board's inability to hire independent consultants. The fourth article concerned a failed effort to get a building-by-building timetable for affordable units. The fifth article analyzed the likelihood of building all railyard towers by 2035. Then came an update from developer Greenland Forest City Partners (GFCP), which is essentially run by Greenland USA. At the meeting last Friday--and as detailed in the developer update at bottom--Solish indicated it would hold 860 units, with 30% of them affordable. That suggests more smaller units, and perhaps an effort to increase the total amount of affordable housing, getting to the crucial 2,250 requirement by 2025. 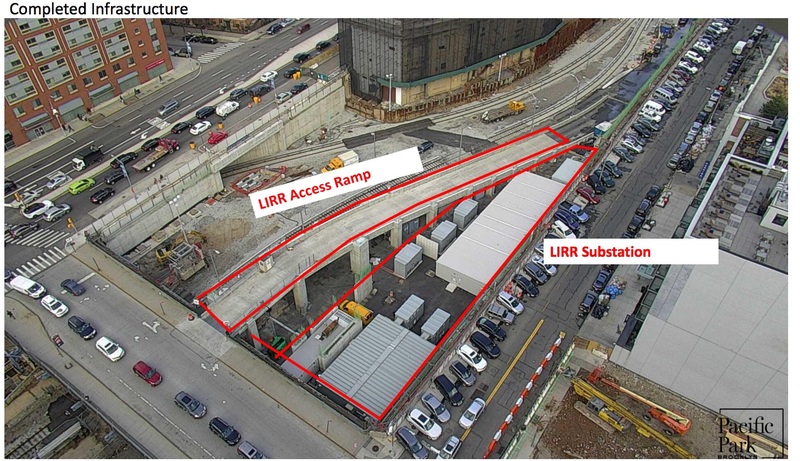 Solish described completed infrastructure, such as the LIRR access ramp from Sixth Avenue into the Vanderbilt Yard, and a new LIRR substation that will offer a permanent power supply. Solish noted that a new permanent office facility in the railyard for LIRR employees has been completed. After Solish showed an overhead photo that included the intersection of Sixth Avenue and Pacific Street, board member Gib Veconi, a Prospect Heights resident, said, "I want to draw directors' attention to long line of cars" parked diagonally at Pacific, on the sidewalk. "I believe," he said, "that's police officers from 78th Precinct." (There's both NYPD signage part of the way down the block, as shown, plus open parking on Pacific.) He noted that "parking in the neighborhood is a significant issue for residents." 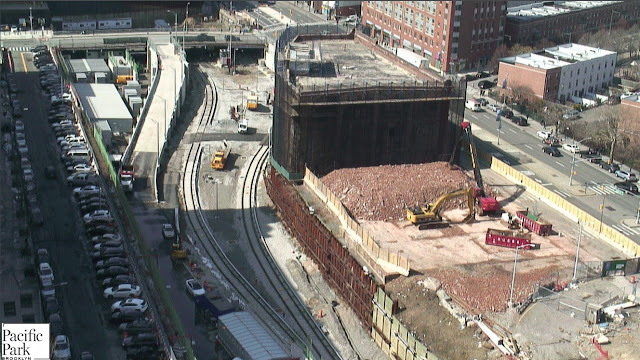 Solish showed progress in demolition of the two buildings that "bump" into the railyard from Atlantic Avenue, which have been demolished--at least in the sections bordering the railyard--by hand, with mechanical equipment used later in the process. "Was that your idea?" asked board member Cy Richardson. "That's the way the railroad wanted us to do it," Solish responded. Solish said the railyard's East Portal, at Atlantic and Vanderbilt, which was originally the only way into the railyard--and a more awkward, indirect process--is being reconstructed, as the more direct West Portal is operational. "This work is expected to be completed this spring, April or May." The final two train tracks, six and seven, are finished, but waiting for third rail power, which should come in the next four to six weeks. He also detailed the establishment of the drill track enclosure in a corner of the B4 site, which "will allow LIRR to bring trains into the yard and park them." That should be done by late April. Solish recapped that four towers are finished, and described the rental buildings (461 Dean, 535 Carlton, 38 Sixth) as "99% leased" or "fully leased." He didn't mention the use of incentives (up to three months free!) to attract tenants to "affordable" middle-income units. He did not say that the 278-unit condo building, 550 Vanderbilt, was sold through. It's not, and the developer last December offered significant discounts in a flash sale. Still calling it "Atlantic Yards"
After Solish introduced executives Jeremy Shell from TF Cornerstone and Thomas Brodsky of The Brodsky Organization, both of them expressed enthusiasm for moving forward on their sites, using--not so surprisingly--the project's original name. 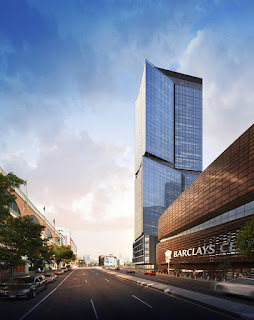 Brodsky said “we are similarly excited to be part of the Atlantic Yards development." The B15 tower, which includes a middle school, will have 312 apartments, 30% of them affordable. It's due in 2022, as I reported. No one asked the executives to clarify the income levels expected, as "affordable" merely means "income linked" and (presumably) below-market. The options under the Affordable New York program (the updated 421-a) include different percentages of low-income and middle-income units.